Maximizing the performance of your boat is not just getting the right motor for your boat; your prop plays a big role in its performance. Top-end, hole-shot or cruising speeds, your rig needs to be propped right. Here is some terminology so you can talk “prop”. A propeller or “prop” is the final piece of the engine and its drive train. It is the part of the boat that transfers the engine horsepower to the water. The transfer is termed as thrust. Thrust is created as the propeller pulls water into the front of it, (the boat side) and pushes it out on the back side. This momentum change is caused by a pull push affect of the blades and the pressure differential from low to high and is the basis for the creation of thrust. All propellers have the same basic parts. However, there are many variables within those basic parts. The descriptions and picture listed below will describe those basic parts, and help you to understand some of the distinctive characteristics of those propeller parts that can vary, causing different reactions. Pitch can be “True” or “Progressive”. True pitch describes a propeller that measures the same pitch from the leading or beginning edge to the trailing or following edge. 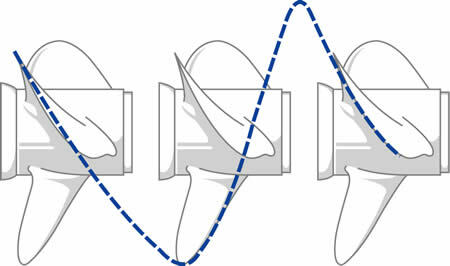 Progressive pitch describes a propeller that starts low in pitch at the leading edge and increases its pitch as the water travels towards the trailing edge. Both styles of pitch offer benefits depending on the type of boat and engine package or set up a person uses. Pitch is the final “gear ratio” adjustment on any given boat. Pitch controls the engine revolutions per minute or “RPM”. Adjusting pitch for any given situation can change a boats performance anywhere in the rpm range and give the boater the desired performance they need while keeping the propulsion system working as the manufacturer engineered. Diameters are limitless. Most propellers have a diameter predetermined by the manufacturer as correct for the pitch, horsepower and application it was designed for. 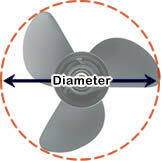 Diameter changes can affect the “attitude” of the boat or the way the boat carries itself. Generally, the lower the pitch of a propeller, the larger the diameter will be. Propellers running at deeper depths can be smaller in diameter while performance applications that surface the propellers while running can use larger diameters. 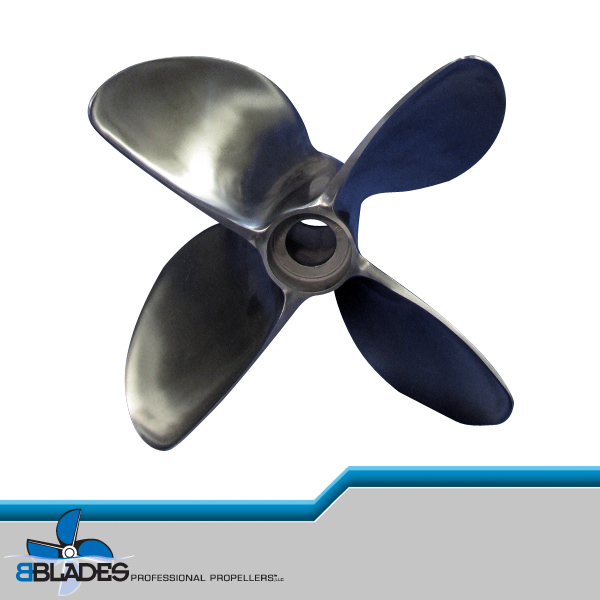 Trained custom propeller shops can adjust diameter to aid in the operation of your specific vessel and its set-up. When the final trailing edge of a propeller blade has a “curl” away from the boat, it is referred to as being “Cupped.” Cupping on propellers was not always used as a standard propeller design. When cupping was first used, it was done to propellers as an easy way to increase the pitch or rake without bending the entire blade. Once propeller shops began to do this, they realized other benefits that came along too. One of those benefits was improved performance. Because cupping can increase pitch, rpm will generally decrease. Depending on where and how much of a cup is added determines the rpm and the boat personality changes. A propeller with one blade would be the fastest and most efficient propeller if it weren’t for the fact that the vibration could not be contained. The reason for its great speed would be the lack of blade drag caused by metal in the water. As blades are added to propeller hubs, the drag is increased. However, the ability to grab more water and decrease the time frame between load and unload is shortened. This means the propeller will “feel” smoother as it grabs water or loads the blades. 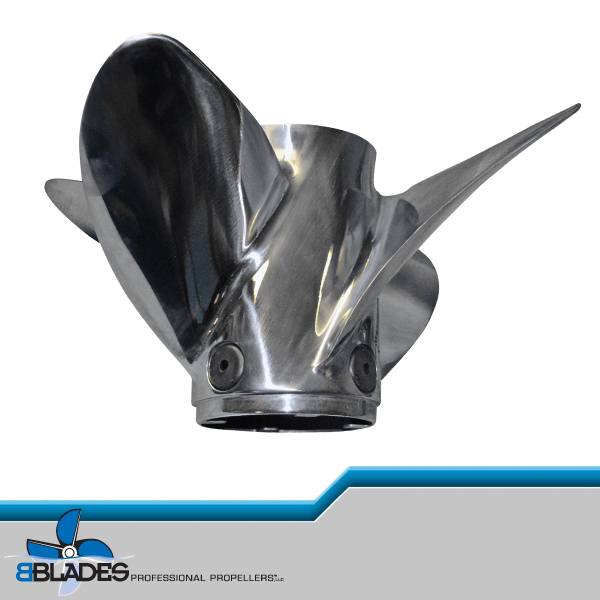 The number of blades does many other things to the performance and control of a vessel. Performance type hulls tend to show the greatest response from adding and subtracting blades. Propellers typically come with 2 to 6 blades.